Introduction: Reconstruction of scalp defects due to electrical burns poses a challenge to the reconstructive surgeon and a lot of controversy exists in decision making with regards to the timing of surgery, debridement of the underlying bone, choice of flap cover and the role of trephining. There also is a paucity of literature on this subject probably because of its rare incidence. Proper management of these cases could prevent serious complications like osteomyelitis of the underlying bone, epidural abscess and cosmetic disfigurement. Materials and Methods: The study was conducted at a tertiary care burn unit. A retrospective analysis was done of the patients with electrical burns involving the scalp, between 2010 and 2015. Results: In the study period there were 135 cases of electrical burns. Out of these 9 patients had electrical burns involving the scalp. 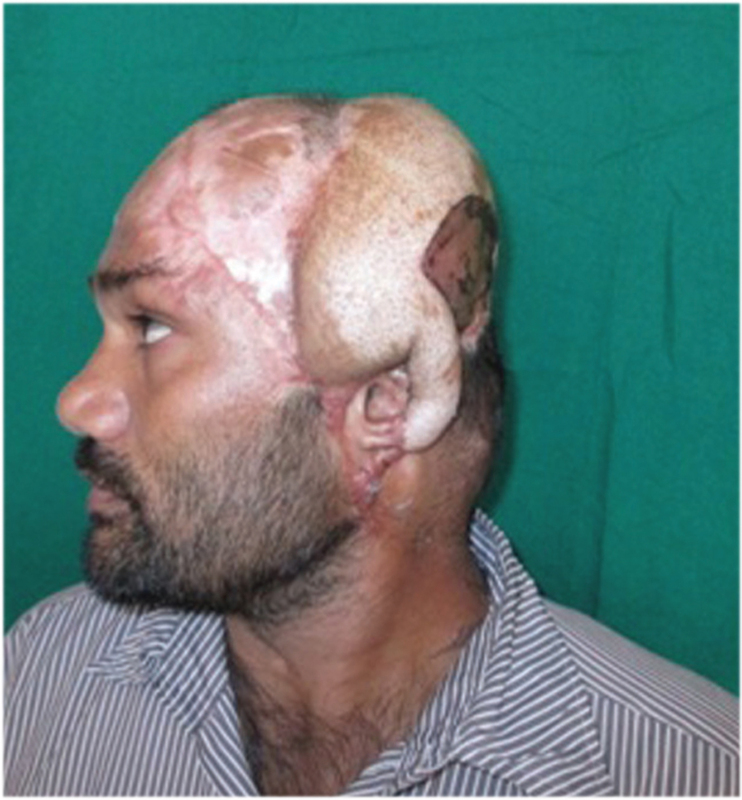 Two patients with scalp defects in which the pericranium was intact after debridement were managed with skin grafts, 4 patients with moderate sized scalp defects were managed with local flaps, and in 3 patients free flaps were used to reconstruct large scalp defects. Literature search showed only two other similar case series with free flap reconstruction. We have proposed a management protocol for scalp defects in electrical burns based on our experience and a review of the available literature. Conclusion: Meticulous debridement of infected/non-viable bone is the key to a good outcome. In view of progressive tissue necrosis in electrical burns delayed reconstruction is preferred. Free flaps are the standard of care for extensive scalp defects. Local flaps and skin grafting can be used for smaller scalp defects. Secondary procedures are required for management of the alopecia and optimal cosmetic outcome. Electrical burns represent only 3–4% of burn cases, and the scalp is involved in only 3% of these cases. Reconstruction of the resulting scalp defects poses a challenge to the reconstructive surgeon, and a lot of controversy exists in the decision making with regards to the timing of surgery, debridement of the underlying bone, choice of flap cover, and the role of trephining. There also is a paucity of literature on this subject, probably because of its rare incidence. Proper management of these cases could prevent serious complications such as osteomyelitis of the underlying bone, epidural abscess, and cosmetic disfigurement. The study was conducted at a tertiary care burn unit. A retrospective analysis was performed of the patients with electrical burns involving the scalp presenting to our hospital between 2010 and 2016. Between 2010 and 2016, there were 135 cases of electrical burns. Out of these nine patients, who had electrical burns involving the scalp, two were managed with skin grafts, four were managed with local flaps, and in three patients, free flaps were used to reconstruct the scalp defect [Table 1]. 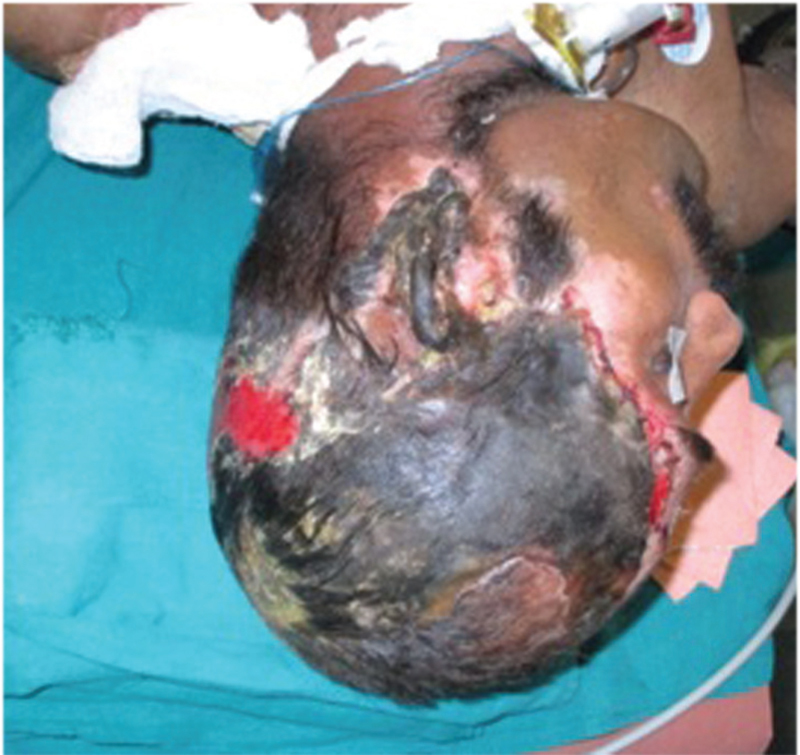 A 38-year-old male presented with a history of high tension electric burns at the workplace. He sustained burns to scalp and bilateral thighs. He was initially treated at a local hospital, where he underwent dressings for the thigh wounds and multiple drill holes were made in the occipital skull. As the scalp wound showed no signs of healing and was infected, he was referred to our burn unit after a month. On presentation, he had an occipital defect − 15 × 18 cm, with exposed bone and multiple drill holes were seen. The unhealthy outer table was chiselled − it appeared to be osteomyelitic, and a latissimus dorsi (muscle only) free flap was used to reconstruct the scalp defect. The occipital vessels were used as the recipient vessels. The flap uptake was good; it was subsequently grafted after 1 week. Later the flap muscle atrophied over 12 weeks and resulted in an acceptable contour [Figure 1][Figure 2][Figure 3][Figure 4]. A 28-year-old male worker at an electrical company, presented with a history of high tension electric burns, when he was working on an electric pole, he fell from the pole and had altered sensorium since then. 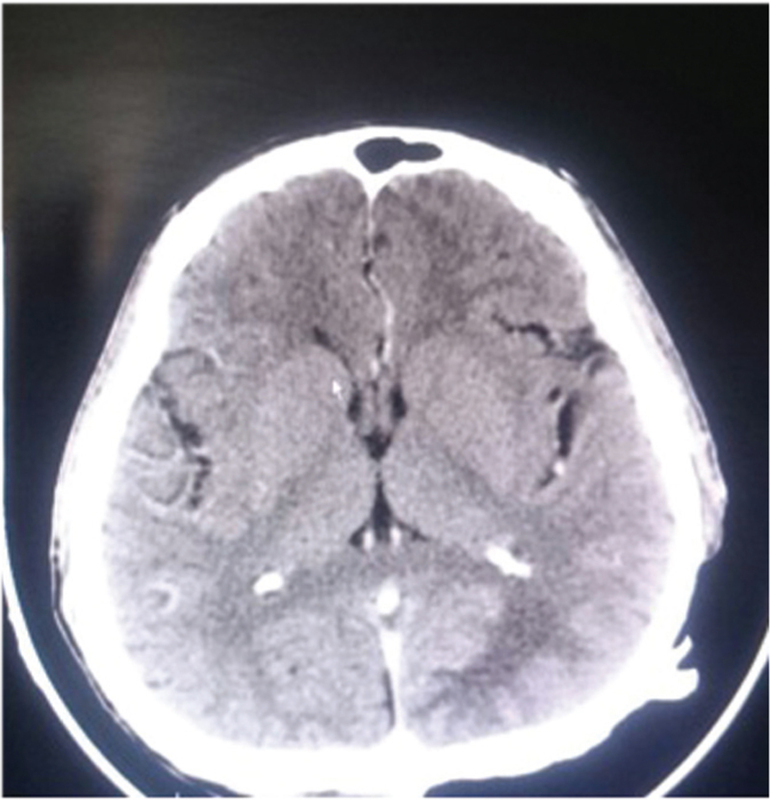 The patient was admitted to the intensive care unit (ICU) and intubated due to poor glasgow coma scale (GCS) and kept on mechanical ventilation. The estimate of the burns was 30% total body surface area (TBSA). Adequate resuscitation with intravenous fluids was given. He underwent fasciotomy of the left lower limb because he had developed features of compartment syndrome. The limb, however, eventually became gangrenous, and hence the patient underwent a below knee amputation, which was later revised to an above knee amputation. The patient then underwent epifascial excision of all deep patches, and the resulting raw areas were subsequently grafted. He had an eschar over the left temporo-parietal region measuring 18 × 14 cm. The eschar was dry, and there was no discharge from under the eschar. CT-skull was taken. The outer table of the underlying bone was found to be non-viable in a few areas. 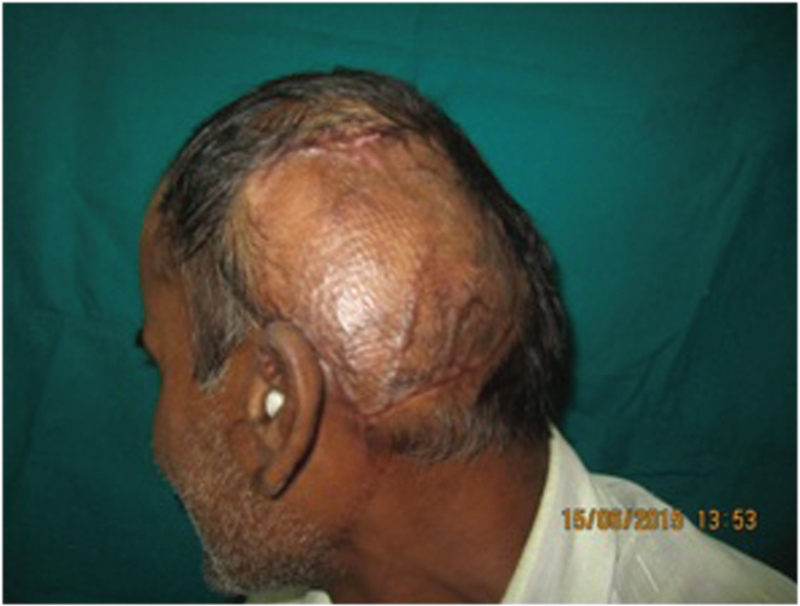 He was taken up for the reconstruction of the scalp wound 2 months after the initial injury. 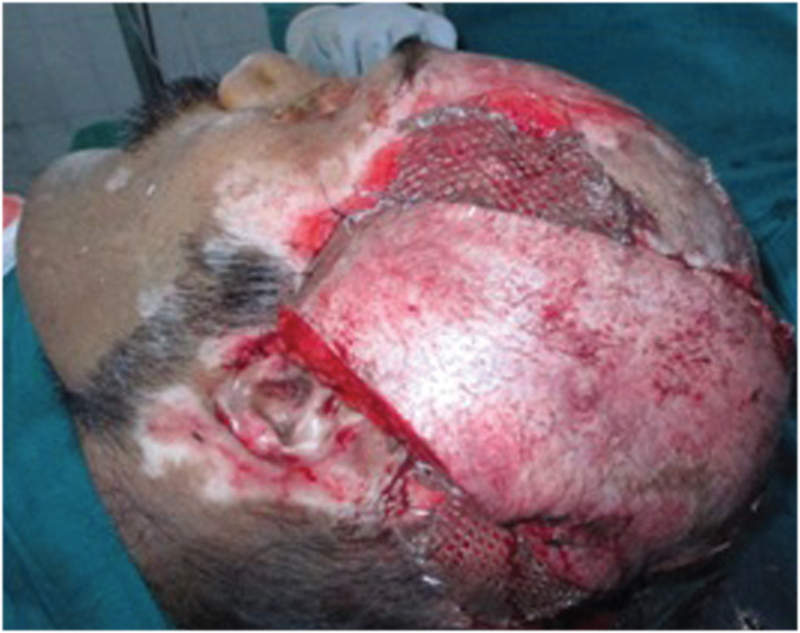 The delay in addressing the scalp burns was because of the fact that the patient was in altered sensorium and on ventilatory supports on admission and then went into sepsis due to wound infection of the other burns. Hence, once these issues were managed, he was taken up for scalp reconstruction. And because the scalp wound was not infected, we could afford to wait. He underwent debridement of the scalp eschar, and the resulting defect was covered with a free anterolateral thigh flap. The superficial temporal artery and vein were used as the recipient vessels. The flap developed venous congestion in the immediate post-operative period (6 h post-op), for which, it was re-explored. The facial artery and the external jugular vein were used as the recipient vessels using a vein graft, and the flap was salvaged. The patient was subsequently rehabilitated with a prosthesis for the left lower limb. A year later, he underwent tissue expander placement for the treatment of the scalp alopecia. Part of the anterolateral thigh (ALT) flap was turned down for helical reconstruction [Figure 5][Figure 6][Figure 7]. A 21-year-old male sustained electrical burns, when he was working on an electric pole and came in contact with a high tension wire. Thus, he had a fall from 7 feet. No history of loss of consciousness or vomiting. He sustained burns over the left upper limb, trunk, and left lower limb. After the initial fluid resuscitation, he was taken up for tangential excision and allografting (with cadaveric skin) of the burns over the trunk and arms. These wounds were subsequently covered with autografts. The scalp wound was serially debrided 5 and 10 days following the injury. The outer table of the exposed bone was chiselled. A free anterolateral thigh flap was used to cover the defect 29 days after the initial injury. The superficial temporal vessels were used as recipient vessels. The flap uptake was good. Local transposition/rotation flaps in were used to cover the scalp defects in these patients. While planning the flap at least one axial artery (supraorbital, supratrochrelar artery/superficial temporal artery/posterior auricular artery/occipital artery) was included in the base of the flap. Incisions were made along the direction of the hair follicles [Figure 8][Figure 9][Figure 10][Figure 11]. In these two cases, the periosteum was found to be intact after debridement of the eschar. Split thickness Skin grafting was performed. A bolster dressing was used to secure the skin graft. Contact burns in cases of electrical burns are commonly seen over the hands and feet. Contact burns of the scalp are quite rare. The scalp must be carefully searched for these lesions as scalp burns are rarely painful and are easily missed on cursory physical examinations. Staged debridement followed by skin grafting. Debridement + vacum assisted closure (VAC). Pedicled flap − trapezius flap. Early cover of scalp defects. with well vascularised tissue is always preferred. This would prevent the underlying bone from getting infected. However, in electrical burns it takes about 7–10 days for a clear zone of demarcation to develop. As progressive tissue necrosis occurs, serial debridements are often required. Delayed reconstruction is advisable in these cases. The general condition of the patient including involvement of other systems should also be taken into consideration before planning a free flap procedure because the patient should be fit for a lengthy procedure, and if other areas which are burned need to be addressed earlier this may be delayed, provided the scalp wound is not infected. Free flap surgery has higher success rates when finished in the early (<5 days) and late (>21 days) periods. Even though there is a school of thought that supports early cover of scalp defects, in view of the progressive tissue necrosis in electrical burns it is better to plan free flap reconstruction at least 3 weeks after the injury. However more studies are required to come to a definite conclusion. Contrast enhanced computerised tomography (CT) scan of the skull should be taken in all patients to determine the extent of involvement of the underlying bone. In cases presenting late it could show features of osteomyelitis. Dynamic studies like technetium-99 scan, single-photon emission computed tomography (SPECT) studies are useful to assess the extent of involvement of bone and soft tissue. Aggressive debridement of the scalp wound is essential. Usually, only the outer table is involved in electrical burns. Meticulous debridement of the non-viable/infected bone is of paramount importance. Debridement under magnification (loupes) is preferred. The extent of debridement is until a healthy bleed is seen. Some authors advocate preservation of the non-viable bone and early flap cover. Subsequent bone regeneration has been documented by SPECT studies. However there have been reports of sequestrated bone presenting late after free flap cover. Hence this practice is questionable. Trephining of the outer cortex has been an age-old principle to promote granulation from the diploe; however, we observed in one of our patients that the intervening bone in between the areas of drilling was necrotic. Probably in large scalp defects extensive trephining might hamper the already precarious viability of the exposed bone. Necrotic bone has a high chance of getting infected. However, in patients with advanced age or with extensive burns, who are not fit for surgery this might be the only option left. Even in these patients serial debridement of the non-viable outer table by chiselling followed by skin grafting might be a better option. This is based on a classification system for scalp defects proposed by Beasley et al. [Table 2]. For smaller defects local flaps − rotation/transposition flaps are used. We found the Ahuja template to design local flaps to be very useful for these scalp defects. 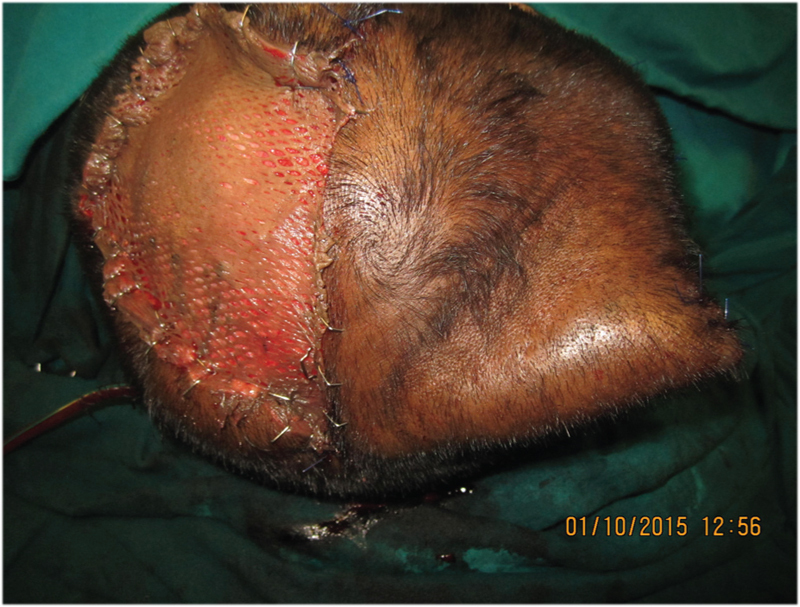 Latissmus dorsi muscle flap with skin graft is the ideal flap to cover large scalp defects. It usually atrophies over weeks as it is deinnervated. This contours the flap to the recipient site. It also has a sufficiently long pedicle. The anterolateral thigh flap is also commonly used flap for reconstruction of scalp defects. Advantages are that a thin, pliable flap can be harvested. Scapular/para scapular flaps and Radial forearm flap have also been used for scalp defects [Table 3]. The recipient vessel should not be in the zone of injury. The facial artery is most commonly used as the recipient artery. But this would often require using vein grafts. Superficial temporal artery and vein are not preferred by many authors because they are prone to spasm, and the vein is thin walled and friable. However, if they are dissected to the pretragal region where the deep branch is just given off they are usually found to be of adequate caliber [Table 4]. We used the occipital artery in one case. This is situated at a deeper plane and requires considerable dissection. However, the anatomy is quite constant, and the vessel is of adequate caliber. For posterior/occipital defects it decreases the required pedicle length considerably. The patient, in whom we had performed the ALT flap, complained that the flap was bulky. Flap thinning can be finished as a secondary procedure. However, of late, suprafascial harvest of ALT and primary debulking of the flap have become a standard procedure. Alopecia is managed with tissue expansion of the adjacent scalp and subsequent advancement/rotation flaps. There is a paucity of literature on the reconstruction of scalp defects following electrical burns, though there are plenty of descriptions of reconstruction following malignancy resections in the scalp. This is probably due to the rare incidence of this kind of injury. On performing a literature search, only two other case series of reconstruction of scalp defects following electrical burns with free flap surgery were found [Table 5]. Meticulous debridement of infected/non-viable bone is the key to a good outcome. In view of progressive tissue necrosis in electrical burns, a delayed reconstruction is preferred. However further studies are required to come to a consensus on the timing of reconstruction in electrical burns. Free flaps are the standard of care for extensive scalp defects. Local flaps and skin grafting can be used for smaller scalp defects. Secondary procedures are required for the management of the alopecia and optimal cosmetic outcome. Hettiaratchy S, Dziewulski P. Pathophysiology and types of burns. BMJ 2004;12:1429. Stuckey JG. The surgical management of massive electrical burns of the scalp. Plast Reconstr Surg 1963;32:538-43. 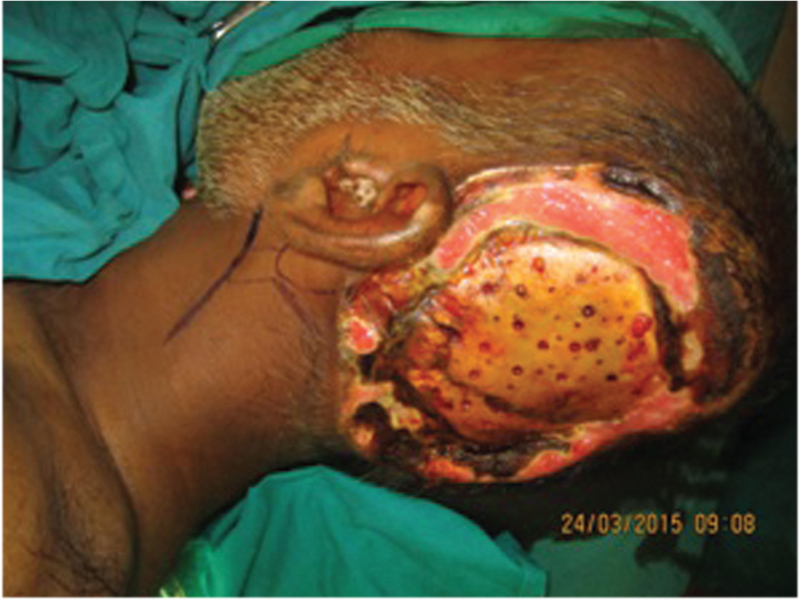 Srivastava JL, Biswas G, Narayan RP, Goel A. Chronically exposed calvarium following electrical burns. Burns 1993;19:138-41. Hunt J, Purdue G, Spicer T. Management of full-thickness burns of the scalp and skull. Arch Surg 1983;118:621-5. Lesavoy MA, Dubrow TJ, Schwartz RJ, Wackym PA, Eisenhauer DM, McGuire M. Management of large scalp defects with local pedicle flaps. Plast Reconstr Surg 1993;91:783-90. Norkus T, Klebanovas J, Viksraitis S, Astrauskas T, Gelunas J, Rimkus R et al. Deep electrical burns of the calvarium: Early or delayed reconstruction? Burns 1998;24:569-72. Godina M. Early microsurgical reconstruction of complex trauma of the extremities. Plast Reconstr Surg 1986;78:285-92. Sarangal A, Goil P, Srivastava S. Delayed reconstruction with free flap: Answer to postelectric burn complex wounds: A 3-year experience. Indian J Burns 2015;23:32-6. Sarıkaya A, Aygıt AC. Combined 99mTc MDP bone SPECT and 99mTc sestamibi muscle SPECT for assessment of bone regrowth and free muscle flap viability in an electrical burn of scalp. Burns 2003;29:385-8. Cruz NI, Saavedra FM. 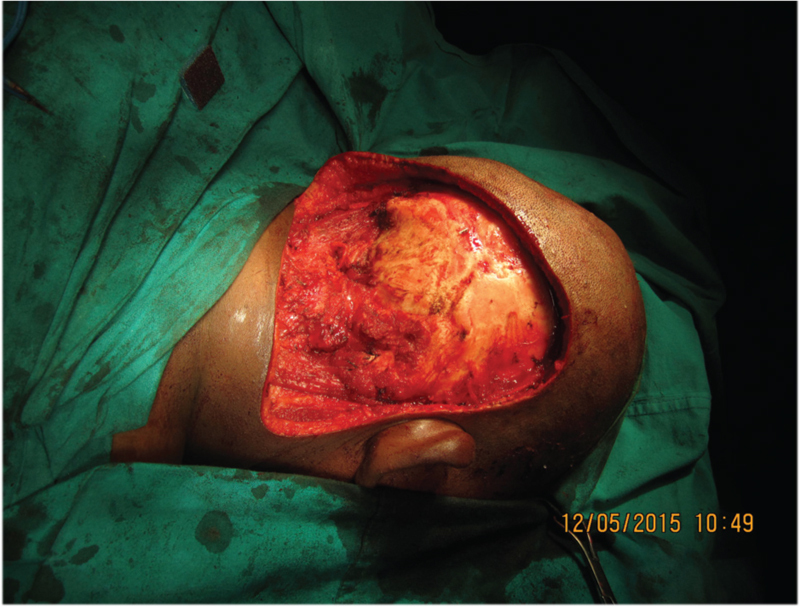 Preservation of nonviable cranial bone after class IV electrical burns. P R Health Sci J 2010;29:83-5. Gümüş N, Coban YK, Reyhan M. Cranial bone sequestration 3 years after electrical burn. Burns 2006;32:780-2. Beasley NJ, Gilbert RW, Gullane PJ, Brown DH, Irish JC, Neligan PC. 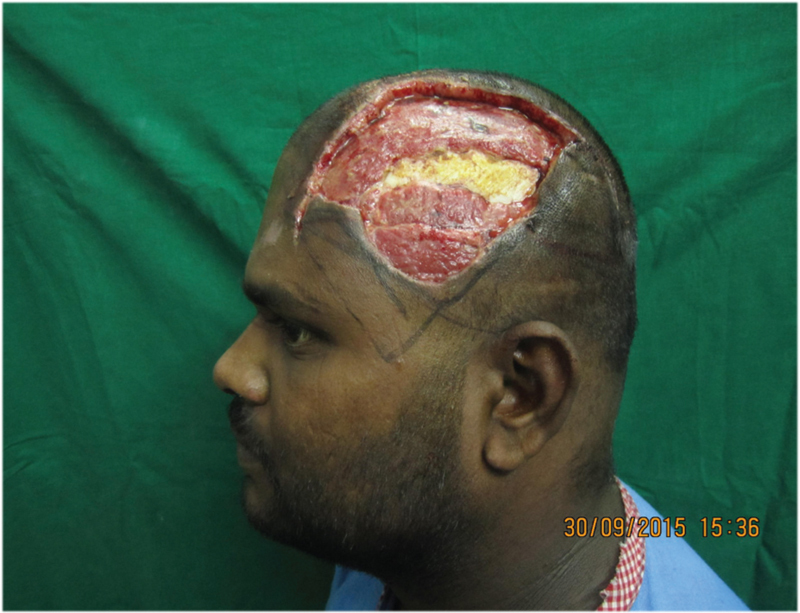 Scalp and forehead reconstruction using free revascularized tissue transfer. Arch Facial Plast Surg 2004;6:16-20. Ahuja RB. Mechanics of movement for rotation flaps and a local flap template. Plast Reconstr Surg 1989;83:733-7. Lutz BS, Wei FS, Chen HC, Lin CH, Wei CY. 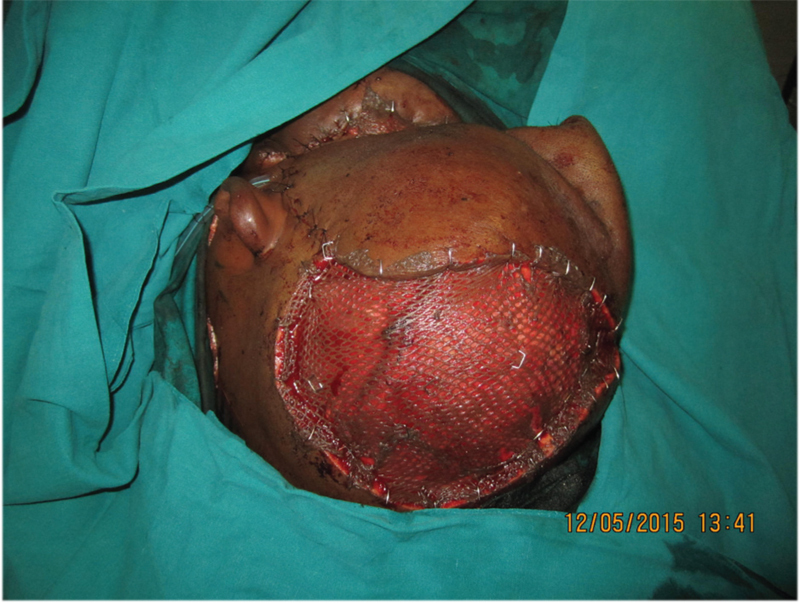 Reconstructive of scalp defects with free flaps in 30 cases. Br J Plast Surg 1998;51:186-90. 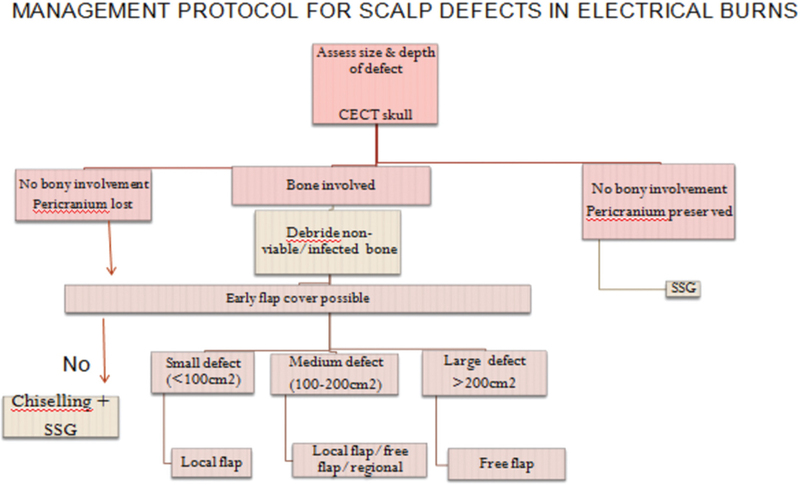 Dalay C, Kesiktas E, Yavuz M, Ozerdem G, Acarturk S. Coverage of scalp defects following contact electrical burns to the head: A clinical series. Burns 2006;32:201-7. Page SS, Murray A, Jovic T, Ball M, Rawlins J. 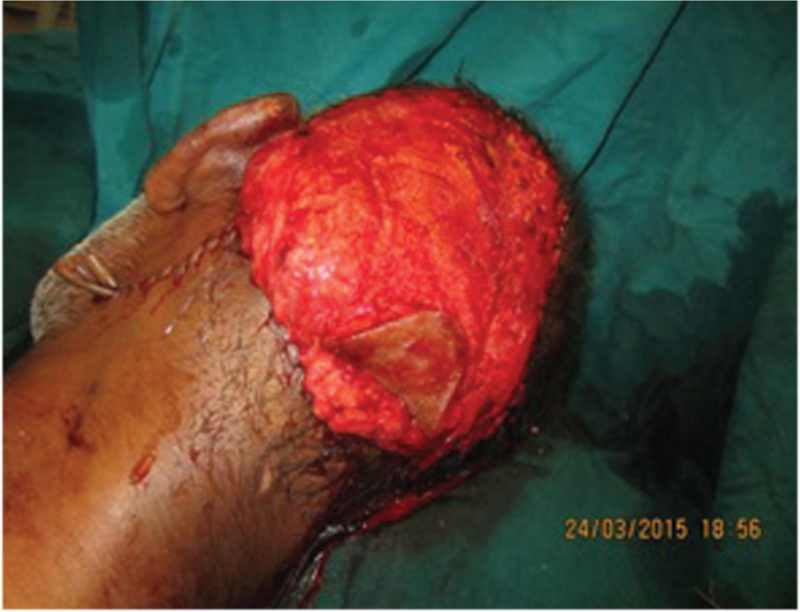 The reconstructive challenges of electrical burns to the scalp: A case series. Eur J Plast Surg 2015;38:229-34. doi: 10.1007/s00238-015-1072-7. Dunn R, Watson S. Why climb a ladder when you can take the elevator? Plast Reconstr Surg 2001;107:283. Baumeister S, Köller M, Dragu A, Germann G, Sauerbier M. Principles of microvascular reconstruction in burn and electrical burn injuries. Burns 2005;31:92-8.